I highlighted several of this year's journey runners in the July 10 entry. The one with whom I could identify most closely was 26-year-old Jen Pharr Davis, who was seeking to set a new women's speed hike record on the Appalachian Trail. She not only set a new record and exceeded her own expectations, she also did it with humility, quiet determination, and virtually no self-promotion. I admire a gal like that! In this entry I'll update a few of the long trail and transcontinental journey runs, hikes, and walks that I mentioned two months ago. One of the athletes has successfully completed her goal, one has finished the first of two separate phases, and several are still out there "nibbling at the elephant." I'll also tell you about one more AT runner that I didn't know about until this week -- he's starting in Maine in a few days. On August 16 Jen successfully completed the 2,175-mile trail after speed hiking (and probably doing some running) for 57 days, 8 hours, and 35 minutes, for an average of almost 38 miles a day. The previous female record was 87 days. Her own pre-hike estimate was 60-80 days, but half way through she saw she could do it faster -- and by gosh, she did! Jen's new husband, Brew, crewed for her so all she had to carry was a day pack with the food, fluid, and gear she'd need each day. At the end of each day Brew carried in whatever gear was needed to spend the night on the trail unless they were staying in a motel or someone's home. She was accompanied on the trail several days in New Jersey, North Carolina, and Georgia by David Horton (not sure if anyone else hiked/ran with her or not) and also received some support from her father and from Warren Doyle, who has hiked the AT more times than anyone else. Even though Jen was sponsored by Diamond Brand Outdoors (shoes, socks, energy bars, etc.) 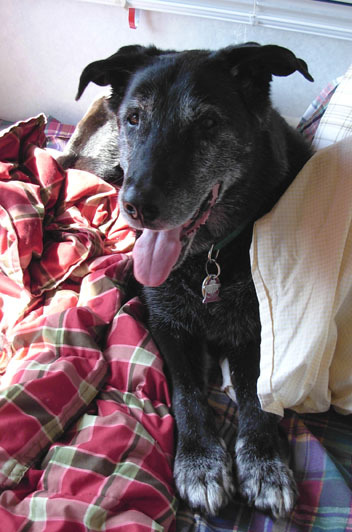 and had a trail blog on the Blue Ridge Outdoors web site, she pretty much flew under the radar the whole hike. I enjoyed the blog entries she and Brew wrote every few days but wished I had information about trailheads and distances so I could "follow" her on my maps and meet her when she was in the Roanoke area. Our home was far enough out of the way that she and Brew were unable to take us up on our offer of "room and board," but they thanked us for the offer. I know from my own AT run/hike how difficult it was to determine where I would be and when, let alone make contacts with folks along the way, so I completely understand. 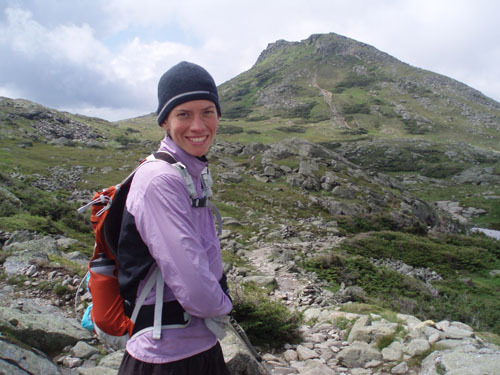 Jen in the rugged Presidential Range of the White Mountains in July; photo from web site blog above. I haven't seen the Trail data since she finished, either, but Warren has mentioned it frequently on the Backcountry.com web site during Karl Meltzer's AT speed attempt as he compares Karl's progress with Jen's (more about that below). I hope Jen will include that information when she publishes articles about her hike and/or writes her book (her intention, according to the newspaper article cited in the opening quote). AT thru-hikers and runners need lots of calories!! From Jen's blog on web site above. David Horton commented in a post to one of the internet ultra lists that he thinks Jen's achievement is the greatest ultra performance that he has seen by a woman. He's been around for a long while and has seen many notable achievements, so that's very high praise. Only four men have ever done the AT faster than Jen: David Horton, Scott Grierson (who was two days slower than Horton in 1991), Pete Palmer, and Andrew Thompson. Even Karl Meltzer may not be able to beat her time. We'll know in a few days. Jen has definitely raised the bar for any other women who want to challenge the AT record! Congratulations, Jen, on your awesome accomplishment. Karl began his quest to beat Andrew Thompson's AT record on August 5, hoping to finish a southbound run/hike in 47 days. That's not going to happen. Karl pretty much knew it after all the trouble he had with weather (lots of rain) in Maine and New Hampshire. He developed trench foot and strained one or more tendons in his leg(s) when he compensated for his sore feet while continuing to put in lots of miles in northern New England, the most challenging part of the AT. He wasn't able to average as many miles as he wanted the first two weeks and lost more time on Andrew's record when he wisely took several days off (or with low mileage) to heal his injuries. Although frustrated, he and his sponsor, Backcountry.com, made the decision to continue on. As of today (September 18, Day 45), Karl has covered 1700 miles and has only 475 more to go. He hopes to be done in ten or twelve more days. Today he's running through the very scenic Grayson Highlands / Mt. Rogers area in southern Virginia and should cross into Tennessee tomorrow. He has a beautiful sunny day today. I hope he gets to "play with the ponies," one of the highlights of an AT trek. It took over a minute for Karl to get across busy Hwy. 220 in Daleville on a weekend morning. 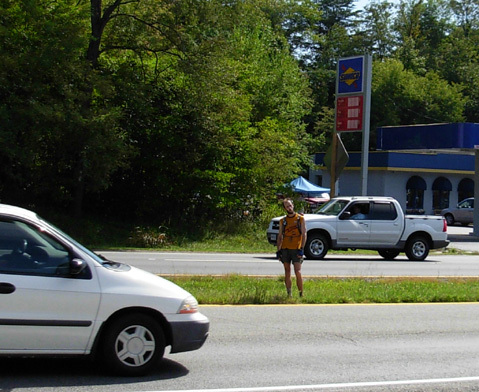 Some AT road crossings aren't any fun, but at least you can see the cars coming at you here. Some folks who have been commenting on the Where's Karl? web site feel the need to denigrate and taunt Karl because he's behind schedule. Most (like me) are supportive and believe that what Karl's doing is even more impressive than quitting when he saw he wasn't going to meet his time goal. He could have cut his losses and tried again next year, like many top runners do in races that aren't going so well. But he chose to finish what he started, regardless of the time it takes. He knows it took Andrew Thompson two or three attempts to finish in record time. Such a feat doesn't always happen on the first try. Karl and crew are using this as a valuable learning experience for his next attempt to break the record. This is his first time on all or most of the AT. It's very different from the trails he's used to running out West. If he has some or all of the same crew members next year, they'll also be much more familiar with both Karl and the roads/trailheads. Yes, he could run into nasty weather again next time that might sabotage his effort, or develop other injuries, but I'm sure he's learned a lot about proper foot care in a multi-week event and a whole heap of other good information that will serve him well next time. On the other hand, I can't blame him if he decides once is enough on the Appalachian Trail because it's so hard to RUN much of it! You can read a lot more about Karl on his own web site at this link and read his thoughts about the AT trek before he began. It's been fun for me to follow Karl's progress on the Where's Karl? web site because there are usually several updates each day and a mileage, elevation, and time tally at the end of each day. Even though the Spot GPS often doesn't work because of the heavy leaf canopy, I can still see where he is on the Google map often enough to have a good feel for his location. That's what I missed the most during Jennifer Pharr Davis' trek -- factual information about location and distances. Sometimes Karl's crew has trouble with internet access in the mountains and isolated back roads. They are also very busy all day long. Four or five Backcountry.com employees have rotated one- or two-week shifts crewing for Karl. When they overlap for a day or two, or if Karl's dad or wife or someone else like ultra runner John DeWalt is there to crew, they can sometimes run with him. All were chosen by the company in part because of their trail running ability. They all seem to be good cooks, too! in the RV at the Daleville, VA trailhead while waiting for Karl to come in for lunch. The crew members also help Karl determine how far to run each day, drive and maintain the RV, purchase food and supplies, prepare the meals, do laundry, crew as often as the route allows and Karl needs them, help keep Karl going in any way they can (patching feet, caring for his dog Binger, keeping him supplied with ice cream, humoring him, etc. ), find doctors and medical supplies as needed, try to keep the whole world updated several times a day, and on and on and on. Considering all the various tasks, it's a wonder anyone has covered the Trail in three months or less with fewer crew members. Just ask Jonathan Basham, Brew Davis, or Diana Shivers how difficult it is to crew solo. With all the time it took me to finish the AT (148 days), I think Jim was more fatigued at the end than I was! Sometimes Karl runs/hikes alone, sometimes he has company. 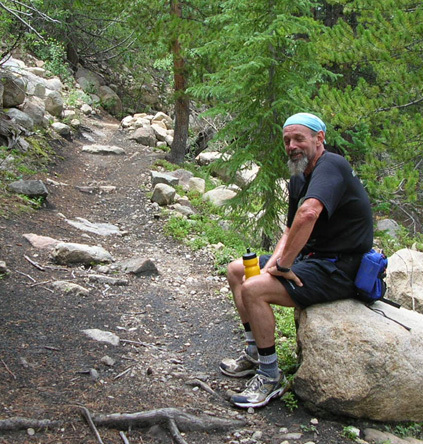 Billy Simpson, an ultra runner Karl knows from Hardrock and other ultras, has been accompanying him on the trail for part of the way. Billy hiked the Trail last year so his familiarity has been helpful. 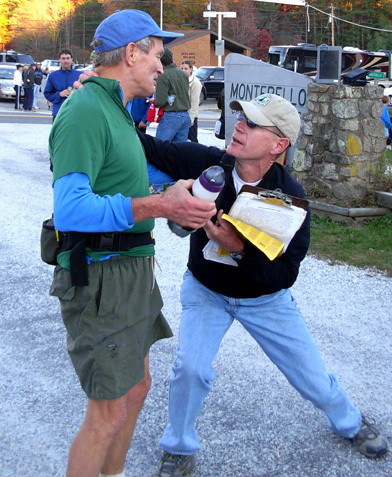 David Horton also came out to run with him for several days when he was in central Virginia, and other runners farther north accompanied him briefly. I'm sorry I'm not fast enough to keep up with him, or I would have asked to run a segment when he was near Roanoke recently. Karl (yellow shirt) shows his appreciation to Greg Goodson before they part. after his crewing stint. That's Billy Simpson in the foreground. I like most everything about the Where's Karl? web site except the snarky comments some people are making. A few letters are even taunting in nature. Maybe that spurs Karl on. His crew told me Karl takes time out a couple evenings a week to read the comments and usually just laughs off the negative ones. He really enjoys the positive comments and all the folks who've stopped by the RV at trail heads to encourage him with words and signs and goodies to eat. The main complaints people mention in the web site comments are about the "spotty" Spot coverage, inadequate updates (give me a break!!! ), the level of commercialism, and the home page banner, which is "over the top" in more ways than one. Warren Doyle has been particularly vociferous about the banner, especially the part that states when "uber ultra-runner Karl" breaks the record he'll "rule the AT as the guy who conquered it." That doesn't sit well with a lot of AT hikers. I'm guessing it's kind of embarrassing for a guy like Karl, too. Jim and I don't know him well, but we've talked to him at races and he's one of the nicest guys you could meet. Warren also harps on the fact that the banner hasn't changed since it's obvious Karl won't be setting a record this year, pointing out every couple of days how far ahead Andrew and Jennifer were at that point. Warren's a Konstant Kritic and I've lost respect for him because of his mean-spiritedness. Of course, the anti-Warren contingent is equally vocal, leading to lots of trash talk from both sides. Sounds just like the current political rhetoric and denigrating between the two major parties less than two months before the presidential election! stop to talk with Billy (white shirt) and Sarah at the Daleville trail head. I can vouch for how expensive a journey run can be, even when done in less than half the time it took me. I can also understand the lure to Karl of being sponsored so he didn't have to bear the brunt of the cost. He's between a rock and a hard place (kinda like every day on the Trail!). I had the opportunity to see Karl and his crew a few days ago when they were in the Roanoke area. I knew where he was starting that morning and the mileage he'd be running before I saw him at the Hwy. 220 / Daleville trail head, but I didn't know what time he'd be starting or how fast he'd be going. Consequently, I arrived almost three hours before he did. I didn't want to miss him! One good thing about the, um, colorful blue Where's Karl? RV is that it is easy to spot! Billy drove it by the parking area a couple times as the crew was running errands in the area before they pulled in next to me. I got to spend about an hour talking with Billy and the two Backcountry.com crew members before Karl arrived at lunchtime. Sarah McConkle was in her first full day of crewing. After lunch, she'd be taking Greg Goodson to the airport to fly back West. There's a photo of them farther up this page. 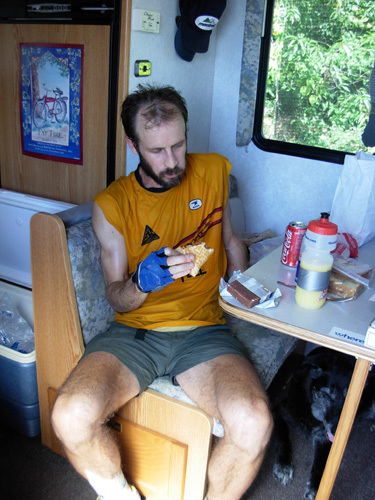 Karl looked tired as he sat inside the camper eating lunch for a few minutes; it was a very humid, hot day in the low 90s and he'd already run 22 miles from Bearwallow Gap before I saw him. Hopefully there were more breezes up on the ridges of Tinker and Catawba Mountains during the 20-mile roadless section Billy ran with Karl after lunch. That's a very scenic section of Trail (the views of Carvin's Cove and Catawba Valley are beautiful from Tinker Cliffs and McAfee Knob) and I was glad Karl was there on a clear day so he could see the views. Karl was hot and tired but ate a hearty lunch, with Binger at his feet. I came bearing Klondike ice cream bars for Karl and the crew. He ate one at lunch with a sandwich and some pizza. Sarah had already joked that the crew no longer tries to count the calories Karl consumes every day -- they now count the hours he spends eating breakfast, lunch, and dinner! He had the opportunity for both mucho calories and time that evening, when he and the crew dined at the Home Place all-you-can-eat restaurant in Catawba, a thru-hiker tradition. I tried to stay out of the way so Karl's crew could attend to his needs the 10-12 minutes he was there, but I did talk to him some. I also talked to Sarah about crewing the next day, when Karl would be going over Dragon's Tooth. One of the little dirt roads Greg had chosen as a crewing point wouldn't have accommodated the RV (the last time I was there I either had to ford a rough stream or cross a very narrow and rickety wooden bridge marked "Private"). I was able to show Sarah other trailheads along the next day's route that should have been suitable for RV crewing. 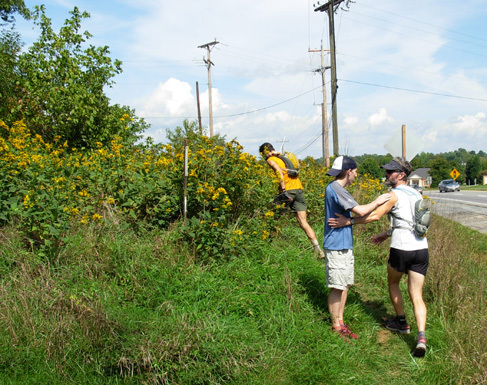 Karl (gold shirt) hits the trail from Daleville to Catawba as Billy says goodbye to Greg. That was Greg's last day on the crew. I applaud Karl's effort to finish what he started. David Horton articulated the point well in a comment on the Where's Karl? web site on September 11: "I think he [Karl] will finish even though he knows he is not going to get the record. It is a very difficult thing to continue when you can't achieve the goal you so much desired. It is a testament to his strength that he is going on and a testament to the toughness of the AT that he is unable to complete it as fast as he desired." Well said, David, and well run, Karl. I hope I have the opportunity to play Trail Angel on the AT again for Karl in the future, whether he is heavily sponsored or not. Though the way it's been recorded on this site is deceiving, that's a total of 54 days 21 hours and 12 minutes. Unofficially, Karl's is the fourth fastest thru-hike of the Appalachian Trail. Most ultra runners I know are honorable, admirable people. So far, there isn't much money to be won or earned in the sport so they don't have to be as cut-throat with the competition as in many other sports. Many ultra runners will literally give you the shirt off their backs during a race if you're in trouble. Often the ones who cross the line first will stay or come back to watch the last ones cross the line. Most of the fastest runners aren't braggarts. They respect the efforts of their fellow competitors. They offer advice if asked and give encouragement to their peers. If you've read my tribute to my running "heroes" you already know how much I respect and admire David Horton. Here's another example of how classy this guy really is (despite his jokes and teasing). 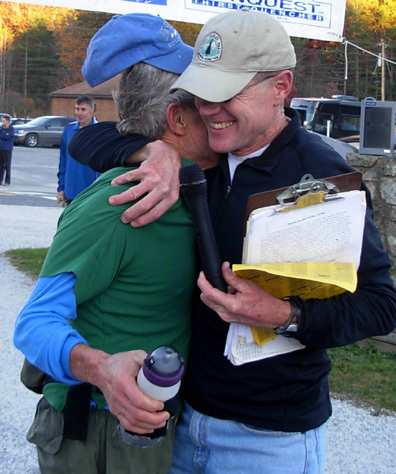 after they finished the 25th edition of Horton's Mountain Masochist 50-miler last November. David also happily ran along with Jennifer Pharr Davis as much as possible as she set a new women's record. And even though I wasn't going fast when I ran/hiked the AT in 2005 (and even though David was very busy getting ready to run the PCT, running and setting a record out there, and recovering from it that summer), he sent me more encouraging e-mails than anyone else! Instead of criticizing Karl like Warren Doyle feels so obligated to do, David was out there helping Karl get on down the Trail. According to the crew, David first arrived on a particularly bad day for Karl and really lifted his spirits. David's like that. I've known him for sixteen years and I can vouch that he's one of the most positive, happy people around. If he's not out setting his own record somewhere else next year, you can bet he'll be helping Karl again on the AT. 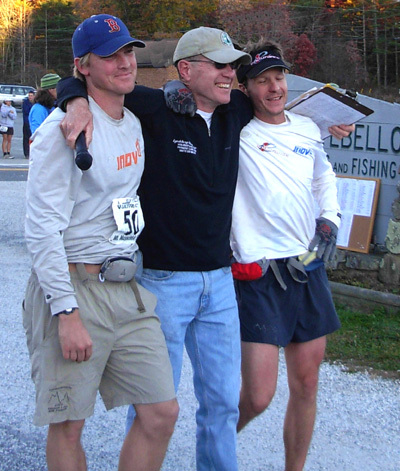 Jim and I don't think we've ever met ultra runner Ben Davis of Fairfax, VA. We recently read that he is beginning a southbound AT trek this weekend to honor victims of Lou Gehrig's disease, also known as ALS. Jim and I know of a middle-stage victim of this incurable disease in our running club. ALS strikes without warning, gradually rendering its victims unable to speak, swallow, move, and breathe. Average life expectancy after diagnosis is only two to five years. "Not a year ago, I was impacted by two different men who were diagnosed with ALS. Both have since passed away. I was inspired by the courage they both exuded despite their diagnosis. It truly makes you wonder how any one of us would handle such news. Because of their inspiration, this fall I will go on leave from my job to run from Maine to Georgia along the Appalachian Trail, 2175 miles, on September 21. For 60+ days, each day being dedicated to a specific ALS hero, we will share their brave and inspiring stories. Our website will tell the untold, in an effort to ignite our community to realize how fragile life really is." Ben and his crew are hoping to raise $1 million for the families of ALS. He is seeking both sponsors and donations. His tentative 62-day itinerary is posted on the web site and he'll also be using a Spot GPS tracker and Google Maps like Karl and his crew have been using (with mixed success). Ben's main pacer is Rick Cheever, who we met last winter at Across the Years. Ben is encouraging others to run with him, come out to see him and the crew, and send e-mails with stories about people with ALS. He'll be in our area the weekend of the Mountain Masochist race, so we'll probably miss seeing him come through. Doug is an ultra running acquaintance of ours from North Carolina who is running and walking across the country by himself with the help of relatives, friends, and strangers he has met along the way who have generously helped him by giving him food, transportation, and lodging. He stays in a variety of places at night, from motels to people's homes to a tent. His route was determined before he left home, but where to eat and sleep has been very flexible. His wife spent a few days with him recently; that really perked him up! Doug began his journey on July 15 in Ocean Isle, NC and by today, Day 56, has gone approximately 1,300 miles (11 miles west of Ft. Scott, KS). That's an average of 23+ miles a day, including several rest days -- so he's actually going farther each day when he's running and walking. Usually he's alone but sometimes running friends and other people accompany him. He plans to run 3,236 miles to Mission Beach, San Diego and hopes to finish by Christmas. Doug is able to post entries several times a week about the trek on his web site so folks can follow his adventures and leave comments. It's interesting to read about the people he meets and the impressions he has of the places where he's been so far. It's not always easy for him to find vegetarian food; there have been some interesting stories about getting the calories he needs. He dedicates each day on the road to someone he knows, lending a very human touch to his journal. He also has photos of his journey. Lisa, an elite ultra runner and coach, has successfully completed the first part of her two-part run/bike trek to raise money for AIDs orphans in Africa. She calls it the "Death Valley 810." In Part I, Lisa ran from Las Vegas (NV) to the start of the Badwater race in Death Valley (CA) in early July. She arrived the day before the start of the official race and completed 135 miles on the Badwater course (described in my last entry) within the 48-hour limit to buckle; runners can take up to 60 hours, but don't receive buckles over 48 hours. Then she ran and hiked to the summit of Mt. Whitney -- for a total of 302 running miles with an elevation gain from 292 feet below sea level in Death Valley to 14,496 feet above sea level on top of Whitney. Yes, that's a nun with her! That's Sister Marybeth, who is also a runner. She accompanied Lisa for some miles from Vegas to Death Valley and did a great job crewing during the race. She also climbed to the top of Mt. Whitney. The second part of Lisa's journey will be the non-stop 508-mile Furnace Creek bicycle race through Death Valley in October. Lisa has already raised $400,000 toward her goal of $500,000 for AIDS orphans. Congratulations, Lisa!! You're well on your way to completing both your distance and fund-raising goals. 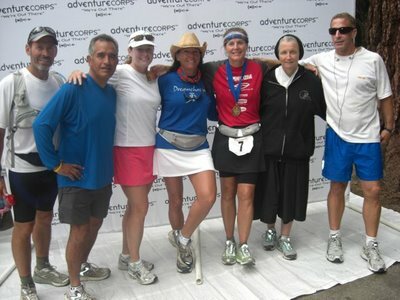 The Running America '08 team began their transcontinental run on September 13 at Fisherman's Wharf in San Francisco. They hope to cover the 3,106 miles to New York City by the end of October. After six long days on the road, they plan to spend tonight in Fallon, NV. This run is a major production. If folks think Karl Meltzer's AT run has too much hype and too many crew members, they should NOT click on the "cast and crew" tab on this site!! An eight-person film company is involved, as well as some major sponsors like Super 8. It's not a charity run. Charlie and Marshall are running to set a record, make a movie, and spread good will across America. Both Marshall and Charlie have their own runner support crews, a total of nine more people who are apparently along for the entire trip. Marshall's wife is crew coordinator, runners' advocate, and communications person. There is a sports medicine doctor, nutritionist/EMT, massage therapist, and Charlie's crew chief, who is a sports and fitness trainer. There are also two drivers and an "environmental director" to "reduce the expedition's impact on the environment." 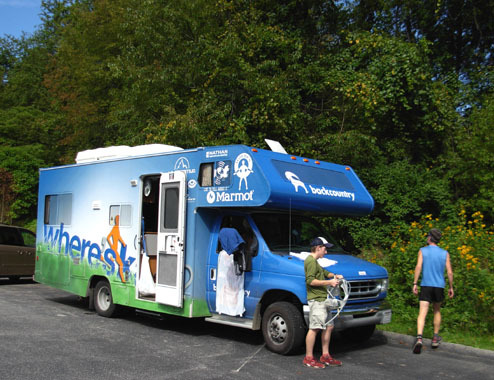 There must be at least two RVs involved; by Day 6, Charlie is having multiple physical problems and is behind Marshall. Motels are also listed most nights in the itinerary. I'm not done yet. 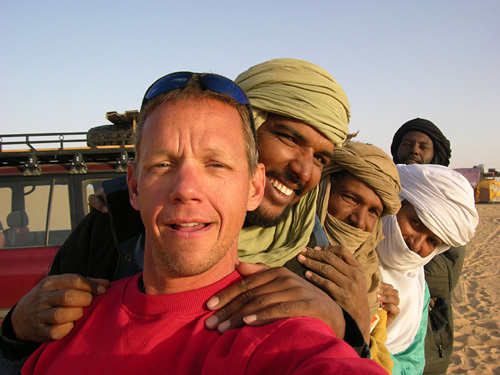 There is a third well-respected adventure/journey runner besides Charlie and Marshall who is also along: Jesse Riley, Marshall's crew chief, has organized several amateur and professional stage races across the U.S., Canada, and Australia. He has run many multiday races and has run solo across the U.S. and Australia. His "bio" on the "cast and crew" link is very impressive. Wow. That's quite a crew! There are several other links at the top of the web site's home page where you can learn more about Charlie and Marshall, see the itinerary, track their progress via Spot (which should work better on the open roads than on the AT), sign up to run with them, read the blog entries from each day (so far, they've been written by Charlie, not a crew person), and leave comments. I'm hoping for photos, but haven't seen any yet. Maybe we'll have to wait for the movie! I planned to follow more journey runs this summer than I've had time for (I do have a life of my own!). They are fun to read. If these journals and blogs aren't enough to keep you busy, follow this link to John Wallace, III's web site, which tracks mostly transcontinental runs across the U.S. Some are solo, some are with two or more people. Some are supported, some unsupported. John has links to five runs/walks that were completed in 2008 and more links for ones still in progress. He also has a pretty thorough compilation of 210 completed transcon journeys. It's interesting to compare them. 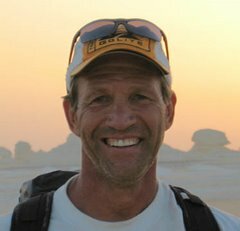 Peter Bakwin started a new site this year that tracks speed records for over twenty different trails (Appalachian, Pacific Crest, Long, John Muir, etc.) and several mountains around the world (e.g., Colorado's 14ers, Kilamanjaro, Adirondack 46 Highest). Most journey runners/hikers aren't interested in, or capable of, setting a new record, but they are interesting to read about and might be just the inspiration someone needs to try to beat a record somewhere.